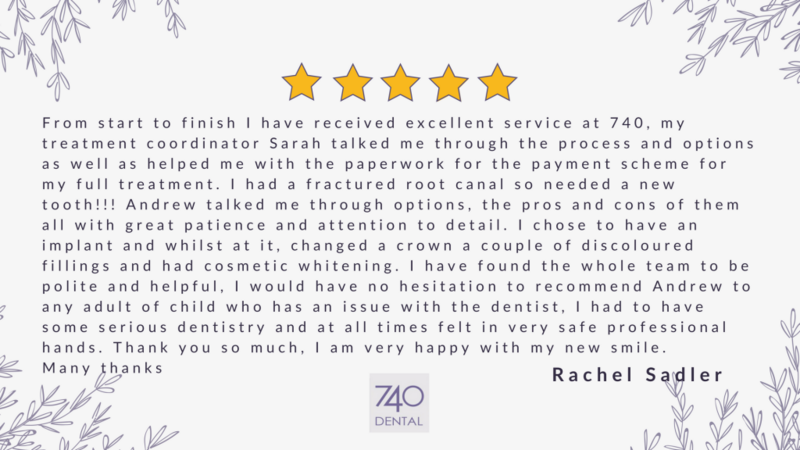 I, and my family, have used 740 Dental for over 40 years (many years under its previous name) and cannot fault the practice in any way. They are totally professional in all respects and invest in the latest technology and equipment: it is clear that they really do care about their patients. I have recently had cause to have several procedures (not something anyone enjoys!) but James Coupe and all the staff ensured that it was as pain-free and stress-free as possible. When I needed ’emergency’ treatment on two occasions I was seen within hours. There are not many practices that would fulfil to this extent. Angela O’Regan is a truly wonderful dentist. She is also always so kind and understanding. I truly do not know where I would be without her. Ruth is my dental hygienist. She too is excellent and always so helpful in every way. They are both amazing and I am always so grateful to both of them. Literally the best dentist I have ever been too! I’ve always been scared and had huge anxiety attacks whilst in the waiting room but since moving here, Andrew has made me feel so comfortable and I don’t dread going to the dentist. Lovely staff, can’t fault anything!! If it weren’t for Andrew Prynne and the amazing team at 740 Dental I don’t know if I’d have ever regained any trust in the dental profession. More importantly, our children are happy and confident to attend their appointments and take on board all the advice offered to them. 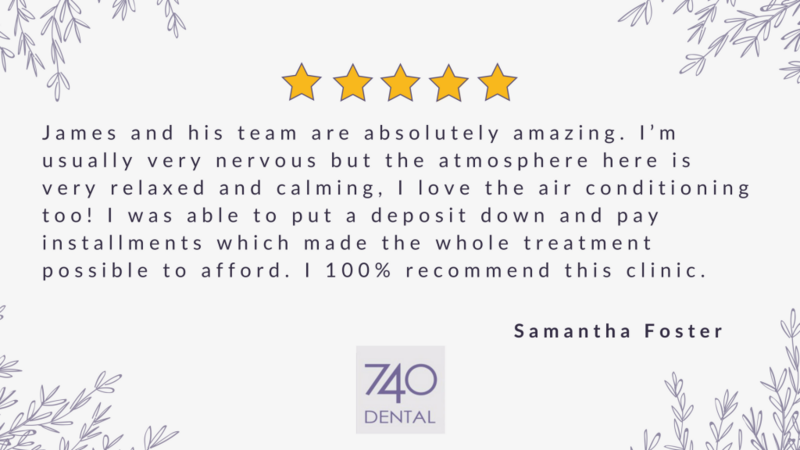 On the rare occasion that treatment is required we always feel fully informed and I know that their comfort with any procedures is of upmost importance to the whole team. I really can’t praise them enough. Andrew has been my dentist for a very long time, I was previously a nervous patient but can’t even remember that now. I lost a front tooth in an accident in my twenties, we struggled keeping a bridge in place. He suggested I get an implant but I didn’t trust another dentist, eventually he did the implant course and I was his first patient. Highly recommended, Richard is my dentist who sees the whole family and has done so for years, he is the best in the business (in my opinion). Katie the hygienist is the only one I like seeing and so glad she’s back from maternity! Due to these two I’ve never had a fear of going to the dentist! I have been a patient at 740 Dental for many years and cannot fault the service. Mr Prynne and his staff are friendly, helpful and, most of all, patient. Always taking the time to explain what is going on and willing to discuss options and make suggestions. I wished I still lived nearby. Andrew Prynne is an amazing dentist, he always make you feel comfortable and doesn’t rush you. He replaced my broken retainer today and did an excellent job. Many thanks! Sharon is so special. I’ve always been terrified of dentists but she has this way of making you feel calm. I’ve seen her for about 17 years and I wouldn’t see anyone else. Sharon is really good and I would highly recommend her for anyone who struggles going to the dentist. She is kind, takes things at your pace and understands people’s fear of the dentist. I had two crowns and two implants done by Andrew Prynne. I would highly recommend Mr Prynne. At last I found a great dentist close to home. I’d recommend Angela to everyone, excellent service. Sharon and the team were brilliant. Been with the surgery for a long time. I’m the only person I know that brags about having a giggle when I go the the dentists.